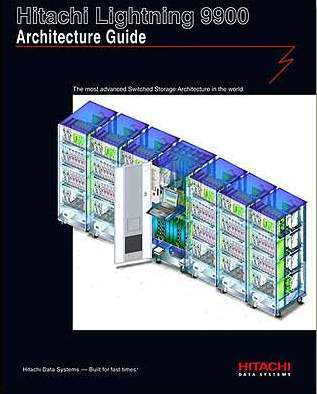 This report was prepared for the introduction of the first switched architecture storage system in the industry and to competitively preempt competition in early 2001. This push eventually led Hitachi Data Systems of Santa Clara CA to achieve a #1 market share in enterprise storage shipments and a phenomenal 70% increase in 2002 sales vs. 2001 despite the weak economy and two wars. It is 71 pages including glossary, with 27 color illustrations, 8 tables, cover page, title page, and back cover. It was designed to increase product awareness and describe business benefits of the products key hardware, and software features relating to its advance product design. Of particular note in the 9900 Architecture Guide is the use of leading edge product illustrations created in Adobe Illustrator with the layering effects of Illustrator 9.0. These illustrations create a transparent effect so that it is easy to understand the inner workings of this leading edge Lightning 9900 enterprise storage product based on an advanced internally switched architecture. Of particular interest is a chapter comparing the performance benefits of the Lightning 9900 compared to the major competitive product that uses a "shared bus" design which has performance restrictions compared to the Hitachi product.